House Republicans Repeat an Obama Error Like the Democrats in 2009, the majority party’s priorities aren’t responsive to the moment. It is challenging for important Republicans on Capitol Hill now. They are leading their party at a time when it is changing and the country has changed. There are fissures in terms of what they believe and what they want. There is no shared, overarching sense of the meaning and purpose of the Republican Party, no agreed-upon blueprint from which to operate. Most of them know that something substantial happened in 2016, when half, and then considerably more than half, of the Republican base followed Donald Trump, along with a great many Democrats. But they are still uncertain of the meaning of the event. I suggested to a Capitol Hill figure last week that it was a populist wave and the future of the Republican Party is moderate populism. He answered that in fact the president, in his famous rallies, was often simply road-testing ideas and applause lines, adopting what got cheers and dropping what didn’t. He’d personally seen this. I thought: I’m sure you saw what you saw, but what you are noting is Mr. Trump’s cynicism when what matters is what the crowds agreed with—what they applauded. When he would say, seemingly in passing, that he won’t touch Medicare or Social Security, people are in enough trouble and a deal’s a deal, everyone—Republicans, Democrats—cheered. Because they are in financial trouble. And because they don’t trust Washington to be fair or wise in cutting or rejiggering essential programs. But the Hill figure did not believe that 2016 marked a change in political direction, and I suppose that’s lucky for him, because if he followed the prompting of a Trumpian base, his donors would not like it. Surely it is reasonable to conclude a big, burgeoning hunk of voters came forward in 2016 with a new definition of what popular, centrist GOP policies would look like—more economically nationalist and more socially and economically populist. The GOP’s first big legislative endeavor, the repeal of ObamaCare, has been understood as a classic fight between party leadership and the more conservative and libertarian wings, and there’s truth in that. I wonder if it will not also become a struggle between the leadership and the Trumpian core. The new bill lacks an air of appropriate crisis, a sense that it is responsive to this moment. I criticize it not from the right but I suppose the left: Eight years ago, I argued ObamaCare would be an unmitigated mess: “The system will be overwhelmed, the government won’t be able to execute, the costs will be huge.” I urged Mr. Obama to focus instead on Medicare; attack waste, fraud and abuse; come up with far-sighted cost saving measures—and, once this was accomplished with bipartisan support, make one little change: open the program to the uninsured under 65. Expensive? Yes. But simpler, cleaner, and better than destroying the health insurance system. The 2008 crash had occurred less than a year before. That was the moment American insecurity began to surge and reasonable pessimism take hold. The two great sociocultural documents of this moment are by the political economist Nicholas Eberstadt and the journalist Christopher Caldwell . Mr. Caldwell, in First Things, focuses on the narcotics epidemic: “The scale of the present wave of heroin and opioid abuse is unprecedented. Fifty-two thousand Americans died of overdoses in 2015—about four times as many as died from gun homicides and half again as many as died in car accidents.” Salisbury, Mass., population 8,000, lost one resident in the Vietnam War. “It has lost fifteen to heroin in the last two years.” In four hours last summer 28 people in Huntington, W.Va., population 49,000, overdosed. These two great pieces in great magazines deserve the deep, focused and alarmed attention of policy makers. We are in the midst of the kind of crises that can do nations in. It is pleasant to chirp, as Speaker Paul Ryan does, of “choice” and “competition” and an end to “paternalistic” thinking on health care. Is it responsive to the moment? Or does it sound like old lyrics from an old hymnal? 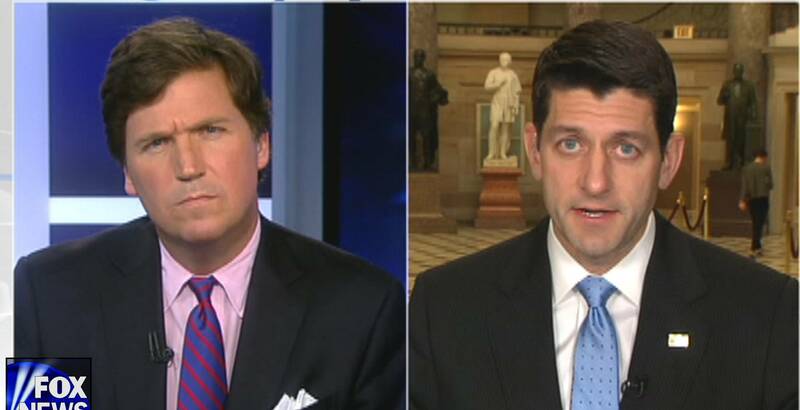 I close with Tucker Carlson’s Wednesday night Fox News interview with Mr. Ryan. It cut to the political heart of the matter. “I’m not that concerned about it,” Mr. Ryan replied. Republicans promised to repeal ObamaCare, and they are. Maybe he should be concerned.